Move Over, Peanut Butter! I'm Nutty for Almond Butter Chocolate Chunk Cookies! Peanut butter will always have a special place in my heart. It's one of my favorite ingredients of all time, and the flavor combination of peanut butter and chocolate is arguably (am I arguing with myself?) my all time favorite. But man, oh man, I have to tell you, I feel a little disloyal to peanut butter as I share this recipe with you. Because here's a cookie that features not peanut butter, but ALMOND butter, and it's as good as or better than any peanut butter cookie recipe I've ever had EVER. Whew! That hurt to say. I remember vividly the day I made this cookie. My brother was moving to LA for school so my mom was in town helping out with the move. While they were out and about running errands, dealing with the housing office, and other assorted not-so-fun tasks, I was in the kitchen making, unbeknownst to me, what would become one of my favorite cookies of all time. As I took the last tray of cookies out of the oven to cool, my mom and brother called to say they had accidentally left some important housing paperwork at my apartment and were going to head over to pick it up. They were in a huge rush and would need me to run down to the street to hand them the paperwork. So naturally, I grabbed a Tupperware container and plopped a bunch of cookies in it for them. My mom and brother were going to need some almond butter chocolate chunk cookies for the road, I figured. Moving Day will be so much better with cookies! A few minutes later, I got a call on my cell phone and it was them, pulling up to the front of my building and needing me to run down with the paperwork. I put my flip flops on, grabbed the paperwork and the container of cookies, and ran downstairs. I presented them with the care package and they seemed excited and thanked me. Then they drove off. I ran back upstairs, and just a few minutes later, I got another call on my cell phone. It was them again. "Something wrong?" I asked. Well yes, something was the matter. They were calling to let me know that they'd run out of cookies. They had eaten the entire container within a mile or two of my apartment. Move over peanut butter, there's a new nut butter in town. I'm nutty for almond butter cookies! Preheat the oven to 350 degrees F. Place one rack in the upper third of the oven and another rack in the lower third. Line 2 baking sheets with silicone baking mats or parchment paper. Toast the almonds in one layer on a foil-lined baking sheet until light golden brown, about 8 minutes. I used a toaster oven, but you can use the oven, too. Do not go too far away from the kitchen because nuts burn easily! 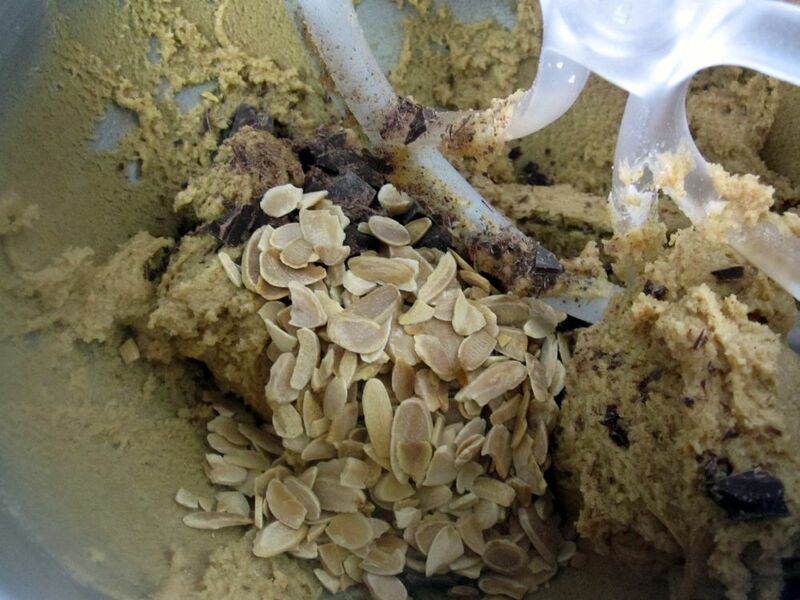 Let the almonds cool, then chop them into smaller pieces. Set aside. 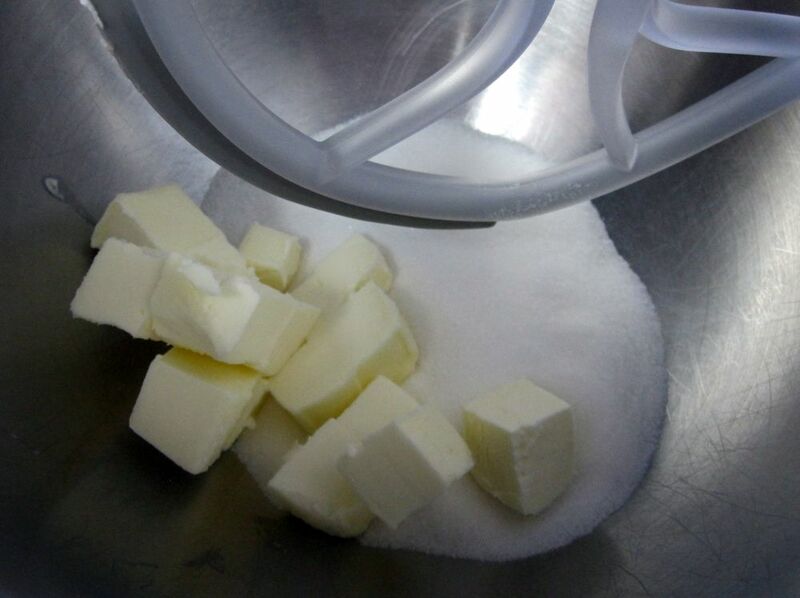 In the bowl of a stand mixer, beat the butter and sugar until smooth. 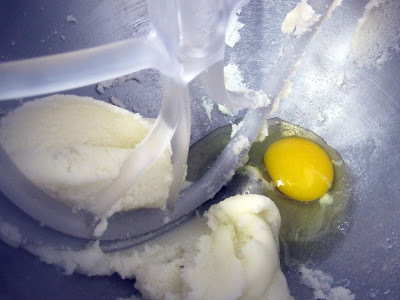 Add the egg and beat until combined, scraping down the sides of the bowl as needed. 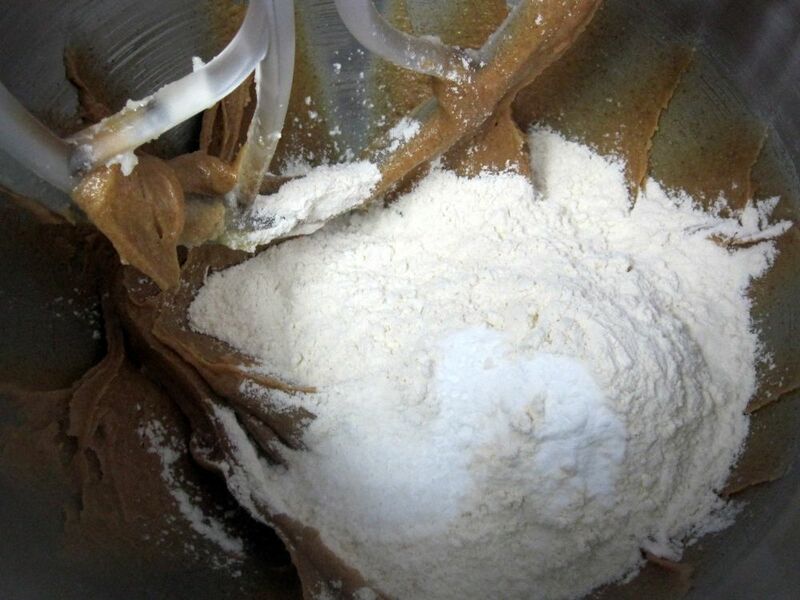 Blend in the almond butter, then add the flour, baking soda, and salt. Mix until well incorporated and smooth. 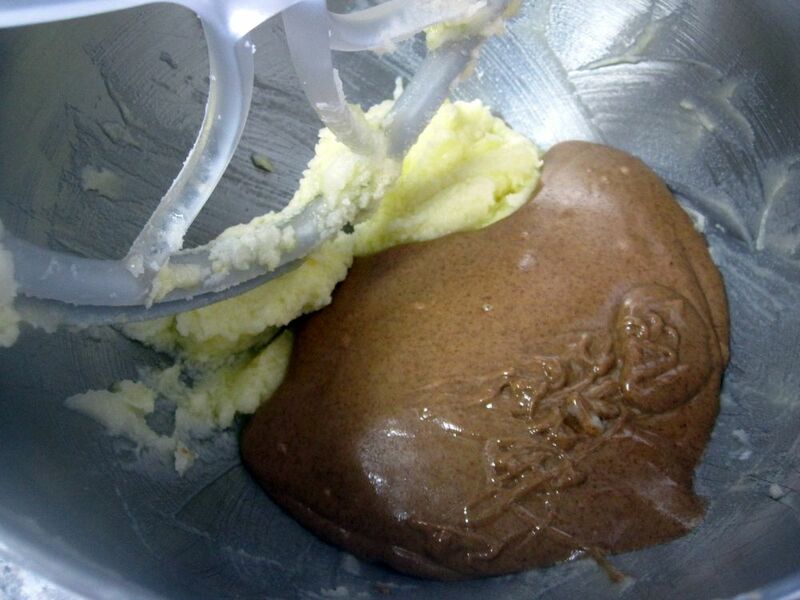 Remove from the mixer and stir in the chopped chocolate and almonds with a wooden spoon. 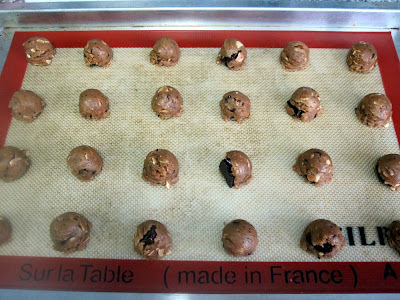 Scoop tablespoon-fuls of dough onto the prepared baking sheets, spacing them 1 inch apart. Feel free to make the mounds of dough larger or smaller (just adjust the baking time accordingly). 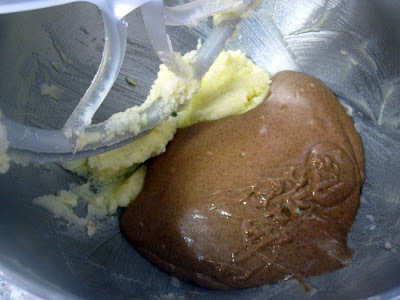 With the bottom of a glass, flatten each mound of dough slightly. Bake for 8-10 minutes, or until the edges are lightly browned but the center still feels soft. Do not overbake them; err on the side of underbaking since they'll continue cooking a bit as they cool. Halfway through baking, swap the two tray locations so they bake evenly. 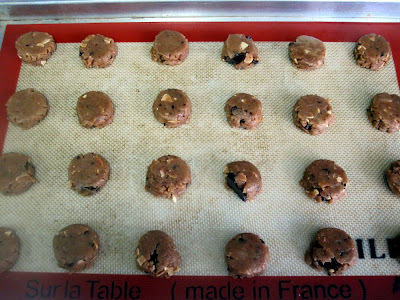 Once done, remove from the oven and allow to cool on the pans on a wire rack for 10 minutes, then transfer the cookies to a wire rack to cool completely. Those cookies were so good. I loved the texture and taste. We tried very hard to not eat them so quickly but it just wasn't possible!